Houseplant looking a little rough these days? Not a problem. 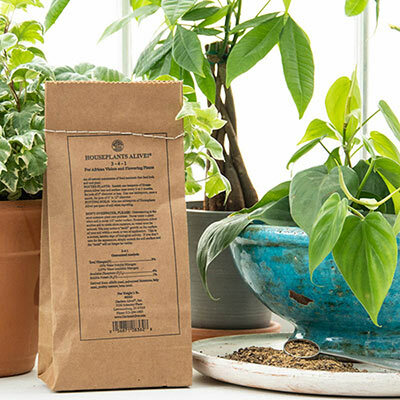 Our 4-4-2 houseplant foliage fertilizer invigorates your leafy houseplants, bringing them back to that verdant green that'll brighten up a room. The 3-4-1 flowering houseplant fertilizer ensures that gorgeous floral performance to make guests stop and admire. It works by dissolving harmful salts and restoring a proper pH balance. This fertilizer will turn compacted, crusty soil—which can cause root binding—into good water-retentive, spongy and crumbly soil. That means less watering, worrying and repotting… a healthy houseplant is not only more beautiful, it's also easier and less time consuming to maintain. For pots that are 6" or less, use one teaspoon every 2-3 months. For 6-12" pots, use one tablespoon per month. Because Houseplants Alive! Fertilizers make the soil more moisture-retentive, you'll want to reduce how frequently you water. A good general rule is to avoid watering houseplants that are still moist ½" below the surface soil.